Delegates from the anti-immigration Alternative for Germany (AfD) party have backed an election manifesto which slams Islam as incompatible with the country's constitution and calls for a ban on Islamic symbols. "Islam is foreign to Germany, it cannot invoke the principle of religious freedom to the same degree as Christianity," Hans-Thomas Tillschneider, an AfD lawmaker from the state of Saxony-Anhalt, said to loud applause on the second day of the party congress in the southern German city of Stuttgart on Sunday. The manifesto which the party is now putting forward has a section dubbed 'Islam is not part of Germany,' twisting a phrase often used by Chancellor Merkel, who said on many occasions that Islam belongs to Germany and that freedom of religion for all is guaranteed by the country's constitution. "An orthodox form of Islam that does not respect our laws or even resists them, and makes a claim to be the only valid religion does not correspond to our legal system and culture," the AfD manifest reads. It also demands a ban on what the party dubs "Islamic symbols of power," like minarets, the towers on a mosque from which religious leaders make the call to prayer, and the burqa, a cloak-like body garment worn by Muslim women. "I call for a differentiation and urge everybody to visit their local Muslim communities and initiate a dialogue," a delegate from the northern city of Lueneburg, Ernst-August Roettger, said. He was the only person of some 2,000 delegates present who made a plea for mutual understanding with Muslims, but was hushed and jeered by the majority. 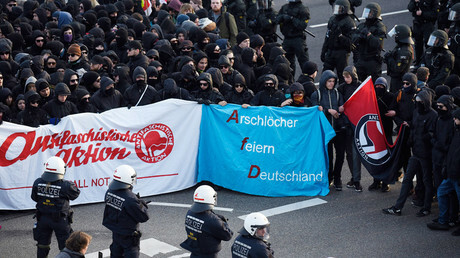 As the program of the debate was announced prior to the conference, AfD opponents tried to block the party members from attending the gathering. Holding banners reading "A**holes party Germany" (Arschloecher feiern Deutschland), several hundred protesters tried to block the entrance to the conference and clashed with police on Saturday evening. Some 400 people were arrested. Despite having won the recent elections in three regional governments, AfD has been widely criticized for going overboard with its increasingly anti-Muslim stance. Outraged by AfD leaders' comments in the build-up to the congress, the Council of Muslims in Germany has compared the party's ideas to “Nazi" ideology, stressing Islam is no different from Judaism or Christianity. "It is the first time since Hitler's Germany that there is a party which discredits and existentially threatens an entire religious community," the chairman of the council Aiman Mazyek told public broadcaster NDR. The AfD, which was set up just three years ago, initially stood against a single EU currency, but it saw a leader and ideology change in 2015 with chemist and businesswoman Frauke Petry coming to power by winning public support with her anti-immigrant rhetoric. The rhetoric has been gaining party support among voters who are disillusioned with the current government’s stance on refugees, yet critics accuse AfD and the like of playing people’s darker emotions to promote xenophobic ideas with their ideology. 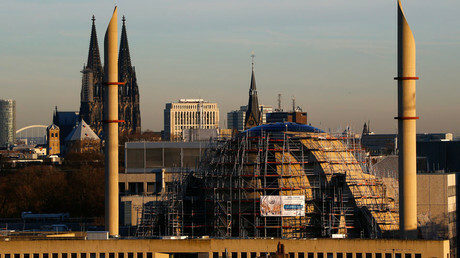 Muslims constitute five percent of the total population of Germany, which hosts some four million of them. The majority which makes up the longer established community arrived from Turkey to work decades ago, but over the past year asylum seekers have mostly been coming from Syria, Iraq and Afghanistan, fleeing war and setting their sights on Germany, which has the largest economy and lowest unemployment rate in Europe.